"My mom has always made this for us on Christmas morning, and since we only have it once a year it makes it even more good. It is so delicious, and everyone enjoys it! When I double the recipe I use 1 pound regular sausage and 1 pound sage sausage." In a medium bowl, mix together mustard powder, salt, eggs and milk. 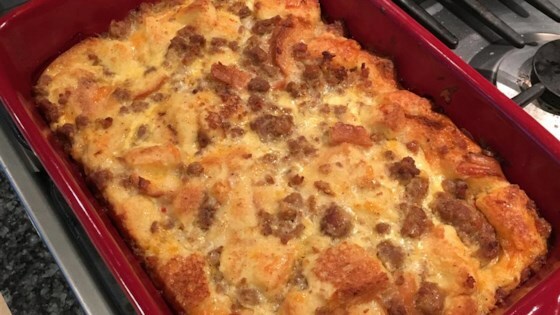 Add the sausage, bread cubes, and cheese, and stir to coat evenly. Pour into a greased 9x13 inch baking dish. Cover, and chill in the refrigerator for 8 hours, or overnight.